This post is brought to you by Sir Kensington’s. Somewhere, in the deep recesses of my kitchen drawers, lies a sushi rolling mat. I have used it once, about five years ago, during my first and last attempt at rolling sushi at home. I made some lumpy rolls that day and deemed sushi rolls to be far too much work to make at home. To buy vegetarian sushi at restaurants (when it’s not on happy hour), though, is to spend way too much money on rice and cucumber. I definitely appreciate the skill involved after my own endeavor, but when do I want to spend ten dollars on rice and cucumber? Very rarely. Veeerrrrrry rarely indeed. Homemade sushi bowls are the answer to my sushi conundrum. There’s no rolling involved, which means they’re much easier to make. You can get more creative with toppings, too, since you aren’t limited to options that roll up well. Best of all, these fresh but hearty bowls keep me fueled for hours. These sushi bowls start off with rice, of course, mixed with toasted, crumbled nori (the green seaweed casing for sushi rolls) and some vinegar, soy sauce and sweetener. I opted for brown rice, which is part of the reason why these bowls fill me up. 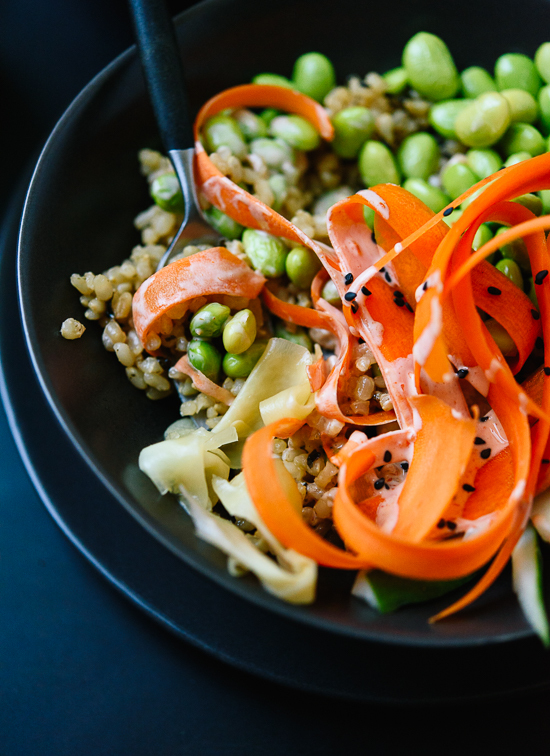 Then, I topped the rice with edamame for protein, creamy avocado slices, short cucumber matchsticks and carrot ribbons, made with my vegetable peeler. The real kicker is the spicy mayo sauce drizzled on top, made with Sir Kensington’s mayonnaise and some sriracha. It transforms the bowl from “tasty health bowl” to, “I want to eat this for breakfast, lunch and dinner and oh man I can because it’s healthy” territory. 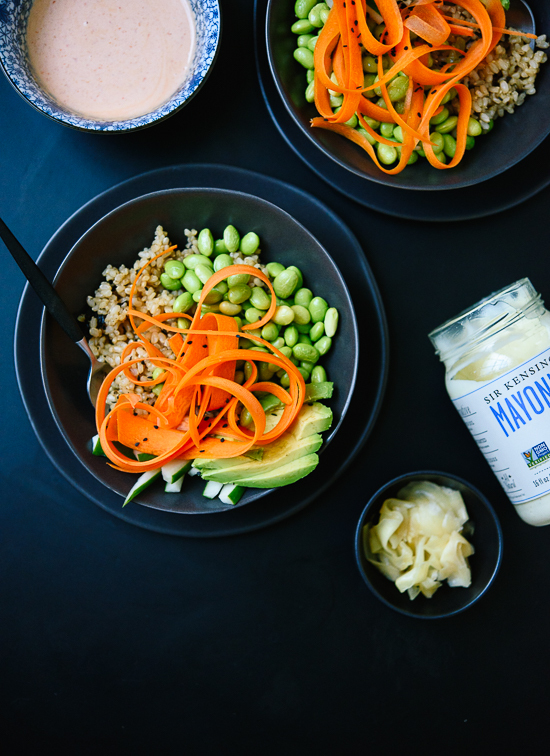 Sir Kensington’s mayonnaise offers a perfectly creamy, tangy base, and I rest easy knowing that it’s made from free-range eggs and non-GMO sunflower oil. Mayonnaise is really just egg yolk whipped with oil and a splash of vinegar, so you can taste the difference in Sir Kensington’s mayo. It’s definitely a superior product, and how cute is that jar?! 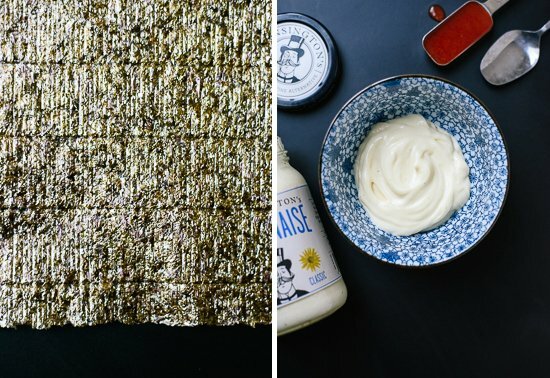 You can shop for Sir Kensington’s mayonnaise (and ketchup and mustard!) on their website or at your local Whole Foods. 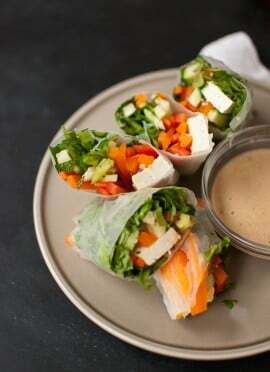 This recipe tastes like veggie sushi rolls, but in simplified bowl form! The spicy mayo sauce really takes it to another level. Feel free to play with the toppings to make this bowl taste like your favorite roll. There are a few steps involved, but each one is super simple. Recipe yields 4 sushi bowls, which keep well for leftovers (for best results, slice the avocado just before serving). To toast the nori: In a large skillet over medium-low heat, warm the sheet of nori until it’s become crisp enough to crumble easily, flipping halfway, about 5 minutes. Remove from heat and tear it into quarters. Crumble each piece into very small pieces in your hands over the rice and drop it into the pot. Stir the nori into the rice and set the rice aside to cool. 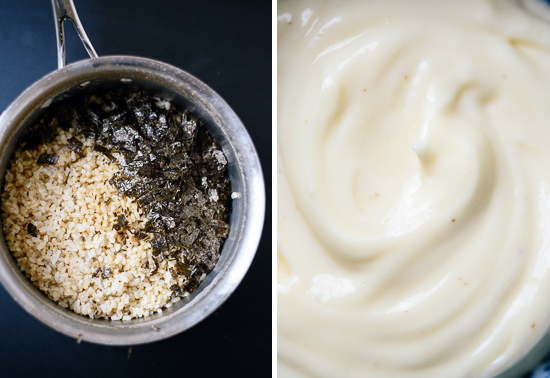 To prepare the spicy mayo sauce, whisk together the mayonnaise and sriracha in a small bowl until well blended. Add more sriracha if you’d like a spicier sauce. Divide the rice between four bowls. 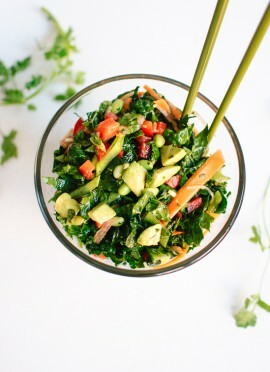 Top with edamame, carrots, avocado and cucumber. 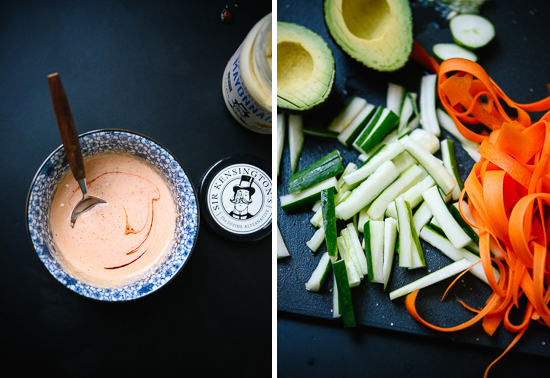 Drizzle chili-mayo sauce on top, sprinkle with sesame seeds and serve with pickled ginger on the side. Make it gluten free: Be sure to use gluten-free soy sauce (tamari is typically gluten free, but check the label to be sure). This post was created in partnership with Sir Kensington’s and I received compensation for my participation. Opinions are my own, always. Thank you for supporting the sponsors who support C+K! I pinned this so I can try it soon! It looks delicious! So there are two things I’ve missed most being pregnant. Cocktails and sushi! Like you, I can’t justify going to get sushi and spending $13 a a simple california roll or something similar. I’m in love with these bowls. Sushi craving satisfied. I have the sushi rolly mat and all the fancy matching sushi dishes to put on a whole sushi production, yet I have yet to follow through, ha! 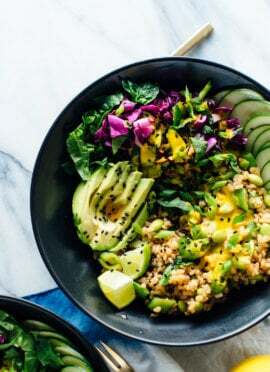 I’m in love with this idea of sushi bowls…so healthful and satisfying, and less time consuming to boot! Bring on that delish spicy mayo! LOL – I hate to think of how many gadgets are in my kitchen that I only used once! And I once tried making a sushi roll without a mat – unsuccessfully. I much prefer your de-constructed version in a bowl. Delicious! Oh man, that would be extra tricky without a mat! I love sushi. But if I just want veggies it can get so expensive, and if I’m eating fish I don’t trust any place that’s too cheap. Sushi bowls sound like the perfect diy solution. Yep, exactly! Hope you get a chance to try these sushi bowls soon. I love this idea! I might try it with quinoa or farro since I’m much more likely to have those on hand than rice. I bet those would work well! Hope your sushi bowls turn out great, Jenna. I have tried doing something similar before because sushi is so expensive to buy, and I’m still hungry after a single roll! I did not get the rice right though, so I am looking forward to following your directions for that. I do have to fit some wasabi in somewhere! I love a good sushi roll, but sushi bowls are a great solution to a sushi craving in need of a quick fix! I have no idea why vegetarian sushi is so expensive. Seems ridiculous to me, though I’ll pay pretty much anything for an avoshitake roll. I love sushi bowls cuz you get all the flavour of sushi at home and they’re so much easier! Okay. Now I know what I’m having for dinner. AMAZING. P.S I love that with a sushi bowl, I don’t have to be embarrassed about wanting to eat a zillion ‘pieces’ of sushi.Yep. Generosity always wins! What a smart way to avoid rolling sushi. I never got that down either. But these bowls look delicious and with the pickled ginger on the side… perfect! We are huge fans of sushi but not the price tag for a family of five (four boys who eat ALOT of sushi). I made this last night and it was delicious. So fresh and filling. It will be making a regular rotation on our dinner menu. Oh goodness, I have two brothers and I can only imagine how much sushi four of them could eat! So glad you all enjoyed it. Lovely Kathryne! I had to laugh… we still bust out our sushi rolling mats on a regular basis and still, my rolls always look a fright. I think I’m going to retire the roll and go with your brilliant bowl option. Much more doable! Hope you’re well and that the book is coming along nicely! Well, kudos to you for rolling your own sushi! I don’t have the patience. Everything’s going well, yay! Hope we can catch up soon. I. Love. this. Don’t get me wrong, I love a good sweet potato tempura roll, but this is much more appropriate for every day consumption. And that’s how much I’ll be eating it…every day. This was wonderful & my Husband loved it! Since I have an abundance of squash growing in my garden, I used speghetti squash in place of rice (it makes a great Pad Tye too) & lemon cucumbers. Thank you, Frances! Love that you used spaghetti squash! This looks great! I’m thinking of bringing it to a work potluck next week. Do you think it would be as good served cold? I’m sorry for my delay, Amanda! Yes, I think it would be great cold or room temp. I love this idea! It’s such an approachable (and healthier!!) alternative. The points you make about sushi rolls being expensive and difficult to do at home are so true. Thank you for sharing!!! Thank you, Jennifer! Glad you agree. Hope you get a chance to try these bowls soon! This was great! I didn’t have any mayo so I subbed tahini and thinned it out with a bit more of the rice vinegar! Truly a winner. Thanks, Kate! Thank you, Terri! So glad to hear it! this was such a satisfying dinner! I used the snack packages of roasted seaweed for the rice which worked out well. This was such a hit for the whole family. My kids ended up using the leftover pieces of seaweed to make their own rolls. This is going in our regular rotation. Thanks! Thanks, Allie! Glad to hear it! Hey Rika, it’s a cutting board from Target. You might also have better luck with a chalkboard. Thank you so much! I just purchased a chalkboard 3 days ago ;) Its working out great. I love this idea! My bf and I have tried to roll our own sushi probably at least a dozen times, and while it usually comes out *alright*, I have never quite felt like it was worth all of that work – not to mention the stress. Plus, what doesn’t taste better eaten from a bowl? In my books: basically pizza and nothing else! Yes! Couldn’t agree more about bowl food. Hope you two will give these sushi bowls a shot soon! Your sushi bowls were a hit tonight (even with my littles)! We topped ours with fried wonton strips (not so healthy, but very tasty). Thanks for sharing and making dinner time delicious! Thank you, Breanna! So glad to hear it! Made this recipe for dinner this week and loved it! I actually had all of the vegetable ingredients in my garden, including the edamame! I added a yellow pepper and used purple carrots. My husband mixed Veganaise and wasabi for his bowl and I mixed tamari and wasabi for mine. Delicious! 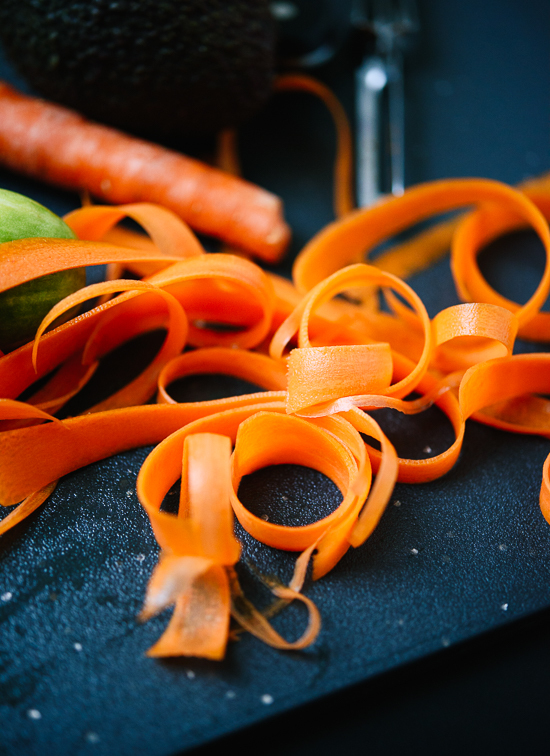 Love your blog – I found you when searching for kale recipes. Thanks, Megan! So glad you two enjoyed it. I bet it was extra tasty with your garden-fresh vegetables! Made these for dinner, they were fantastic!!! Simple but delicious recipe. Thanks for sharing! That’s great to hear! Thanks, Patty! I made these yesterday for lunch and they were delicious. Very easy and with all the taste of sushi and none of the hassle. Great recipe! Thank you, Kate! Happy to hear it! Loved this recipe! Actually, I’m still loving this recipe (leftovers for lunch). I made this last night for Meatless Monday and it was a hit with me and my 3 year-old. He actually thought the carrot ribbons were super special and couldn’t get enough. I have made this several times, and it still never ceases to amaze me. I really appreciate the level of attention you pay to your ingredients, like the seasoning for the rice, and the spicy mayo – it elevate rice and veggies to a new level. You also still manage to keep your recipes approachable, so I am not afraid to try them out! Just made this for dinner tonight for probably the 6th time. My 4 year old looked in the bowl and said this is his favorite dinner (which he says about pretty much anything with avocado – but I still like to hear it). I didn’t have the nori today but the rice is still delicious without it!! Wow, that is so great! I can’t imagine my four-year-old self would have eaten a sushi bowl. High five! This was AWESOME! We made the rice in the morning, and let it cool in the fridge until dinner time, so this whole meal came together in the time it took to chop a few veggies. My wife isn’t a huge fan of spicy things, so instead of the spicy mayo, we cooled a cream cheese block in the freezer, and cut it into small squares for the Full-California. What an easy way to do sushi at home! And once it was all shoved in my pie hole, it tasted exactly like restaurant sushi! Belated thank you for your comment, Daniel! So glad you both loved the sushi bowls. Yes! I love this recipe and use it as a jumping-off point for variations, like adding a quick one-egg Tamagoyaki (I like the recipe from Just Bento) or lightly pickling the vegetables to bump up the flavor. I also chop up the pickled ginger and mix it into the rice with the seasoning–helps spread around the deliciousness! I am always excited for lunch when I know this is in my lunchbox. Thank you, Erika! I want more of your lunches. Kate good afternoon, can I substitute on the mayo? Would love to try this recipe since I have been craving sushi. I made the vegetable sushi bowl and wow! I am hooked! Filling and tastes great! Easy to make. The mayo and hot sauce is a great combination; I am going to put it on everything! Thanks for this one! Yes! Tahini might work; check the recipe notes. I’ve also been thinking that a light avocado sauce would be awesome. maybe, i’ve never tried suchi rolls before but got nori by mistake instead of kelp seaweed for another recipe. ( see Edgyveg on youtube, vegan fish and chips) but now i’m thinking why not cucumber skin sliced to the same height and coated with nori flakes?Then rolled up and stick with cornflour paste infused with nori soaked water? mm think i’ll try that , got nothin’ to lose as I have all that at home. Sounds like a good use for kelp seaweed to me! That stuff is very good for you. I gave this recipe a try last night changing out a few things for items I had on hand. Even with those few items I changed out my husband and I loved this recipe. 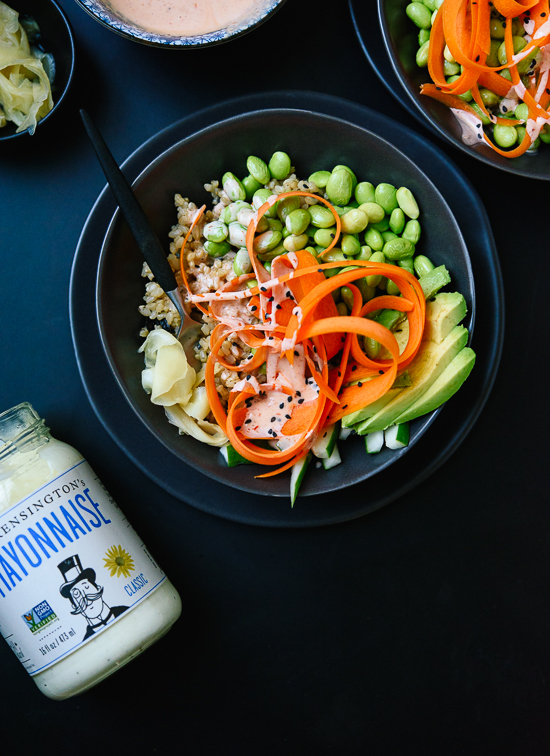 All of the ingredients together make for a wonderfully flavored and filling “sushi” bowl. Instead of cucumber I used the zucchini I had. For the mayo sauce I didn’t have sriracha so I put garlic, chili and a dash of paprika in the mayo. It still turned out tasty. I have tried quite a few of the recipes you have posted, new and old, and every single one has turned out fantastic. I can’t thank you enough for this blog. Thank you for inspiring us! I know my husband has been enjoying the variety of new dishes. It makes me happy he is enjoying meatless meals with diverse nutrients. Lindsay, thank you so much for your thoughtful comment, and I’m sorry I didn’t thank you sooner! Delighted to hear that my recipes have been turning out well for you, even with variations on this one. Yay! 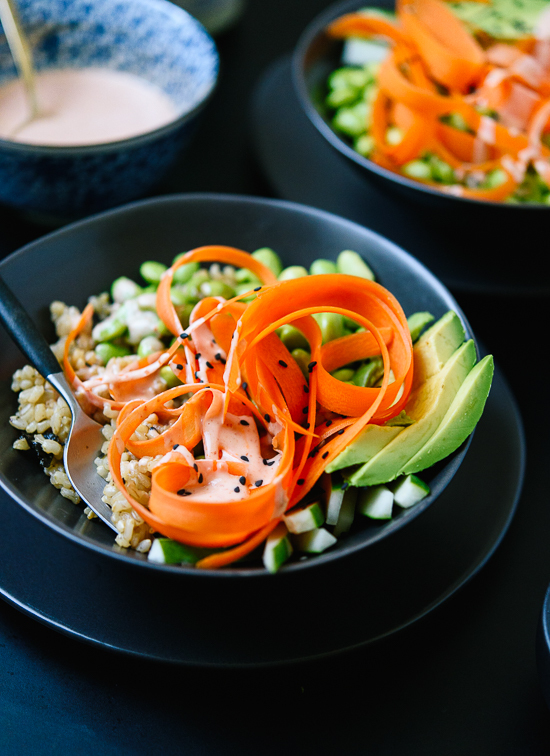 OH my goodness Kate, I have loved every recipe I’ve made from your site….but I have to say the Sushi Bowl is the best yet, YUM!! This recipe is perfection! Eating it for lunch as we speak and I can’t wait to make it again. Well done!!! I’m so excited about this recipe! I’m a couple months pregnant and have been craving veggie sushi the whole time (though i normally eat fish sushi, the thought of that makes me want to hurl-and there’s the “not safe for pregnancy” issue.) Now I can satisfy the craving without having to spend major moulah. Thanks! When did you use the soy sauce? Sorry, when it says “tamari” in step 2. I just made these. Actually I am stuffing my face with it right now. It is amazing. So Amazing! And it was easy! And cheap! And didn’t make a lot of dishes! (I did make the sauce for the rice in the microwave to avoid dirtying a pot) My kids are even into it. Thank you. I made these this weekend with my boyfriend. I’m a vegetarian so I kept the bowls veggie-friendly and he did not miss the meat at all! Sushi craving satisfied and at a reasonable price! I’ve been reading your blog for a while and have made lots of your recipes, but for some reason never this one. After it came up in another roundup I decided it was high time, especially since I was craving something light and veggie-filled after the holidays. This recipe is delicious! It hit the spot. The only swap I made was that a used wasabi mayo instead of the sriracha, because that’s what I had on hand. I will definitely be making this more! This is my third recipe of C&K I’ve made in the past ten days and it’s delicious! One can definitely throw some seated tuna or grilled salmon on top but it’s also great as a vegetarian salad entree. delicious!!! Omg these sushi bowls are sooo good. Fresh but filling (I used a quinoa brown rice blend). And so colourful and pretty! I’m glad I sprang for the garnishes- the sesame seeds and pickled ginger really complete the bowl. 10/10! Awesome! So glad you loved this, Melissa. And you’re right–the garnishes totally make it! I’m in love with this recipe. I just made a cross country move to a town without a sushi restaurant which inevitably means it’s all I want. This delicious recipe has saved me, I’ve made it twice this week because it’s so good. Thank you for this one, it will definitely be in my regular lunch rotation. Made this twice so far! It’s a perfect light-but-filling meal and the prep goes really fast. Score! Sounds like this was a hit, Barbara! I understand the mayo conundrum, but Sir Kensington’s is a great option. This is a DELICIOUS — and as you say, much more affordable — way to get those yummy sushi flavors! I was thankful to find pickled ginger, nori sheets, and an awesome kikkoman wasabi sauce at my grocery store (a great addition). This is going to be a summer staple for me — thanks for the creative idea, Kate! I’m glad the stars aligned and you could find all of those ingredients, Christina! Sometimes they’re hard to hunt down in one store. Finally commenting on this, because although I was a little skeptic at first, after trying it out it has never been out of rotation for more than a few weeks. I am definitely not a ‘fröbel’ cook (is there a proper English translation? Like, I rather make stews and pasta and one pot dishes, than decorating cupcakes or, to stay on topic, have the patience and skill to roll and assemble sushi), so the idea of just tossing in the nori with the rice, I think it’s brilliant and makes all the difference between ‘meh too much work’ and ‘put it on weekly rotation’. I was a little skeptic about the mayonnaise combined with sushi, too, but of course it works great, and I’m varying now between chili mayonnaise and mayonnaise with some wasabi mixed in it. Thank you for this lovely recipe! Gourmet, maybe? Either way, I know what you mean! I’m so glad this was easy enough to make, and turned out delicious, too! I didn’t make this, but my friend did, and it was excellent! I cant wait to try it myself!! Thanks for the very cool and delicious recipe! Don’t remember how I stumbled across this, but so glad I did. Made it tonight with a few tweaks: Reduced amount of edamame but added baked tofu cubes, and used sriracha mayo thinned with a little lemon juice. My meat-eating family loved it! Made this for dinner and added some mushrooms boiled in a miso broth as well as grilled salmon marinated in soy sauce, sesame oil, ginger and miso (had some salmon in the freezer and had non-vegetarians coming over) Anyway, this was a hit, so wonderful on a summer night and I also ladled some of the miso broth from the mushrooms over the top. Thank you, Aadya for sharing. I really appreciate the review! I cook for about 100 people every Sunday lunch. I usually offer at least 4 options. I made your sushi bowls as one of the options one Sunday. Proved very popular. Have shared the recipe with my son. He is going to make it on Saturday when he has friends over. Was going to make soup and really likes the idea of having the fresh ingredients. My family is actually pescetarian (We make your recipes allllllll the time), so I decided to go ahead and head out to my local health food store where they have fresh made Poke, and I threw that on top. Voila. My kids, husband, and I all adored it. THANK YOU! You’re welcome! I’m glad you are enjoying my recipes, Grace. We make this over and over, so delicious and easy!! Wonderful! Thanks for the review, Erin. Wonderful! Thanks for trying it, Nicky. So good! It’s as if a sushi roll and a garden full of veggies had a baby! A great way to describe this, Rosie! Thanks for the review. Thanks for sharing and making dinner time delicious! Thanks for this great recipe. I’m really into eating this veggie rice bowl my hospital cafeteria carries in their sushi section. Like yours but with shredded red cabbage, no edamame or ginger. I’m making my husband and I lunch, happy to be at Home today in my mountains of the swannanoa valley of western North Carolina after working with the new mamas and babies as a nurse yesterday. Mine has to be with carrots and kale, cut super thinly and I’m marinating in a little rice vinegar now. With of course the avacados and your tow sauces. My cafeteria drixxle S them over the dish! Thank you for sharing, Mollie!